Multiparameter water testing meters are key tools for electrochemistry measurements. Many environmental, laboratory, and research scientists rely on these water quality meters to take accurate and efficient measurements of many different substances simultaneously. 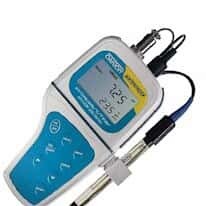 The parameters most commonly measured include pH, conductivity, dissolved oxygen (DO), temperature, ORP, TDS, turbidity, barometric pressure and salinity.